Heat oven to 375°F. In ungreased 8-inch round pan, place 1/4 cup butter; heat in oven 3 to 4 minutes or until butter is melted. Stir in brown sugar and corn syrup until well blended. Sprinkle with pecans. In small bowl, place 3 tablespoons melted butter. In another small bowl, mix granulated sugar and cinnamon. Separate dough into 10 biscuits. Dip biscuits into melted butter to coat all sides; dip into sugar mixture, coating well. Arrange biscuits, sides touching, over topping in pan. Bake 18 to 22 minutes or until golden brown. Cool 2 minutes; turn upside down onto heatproof serving plate. Let pan remain 1 minute so caramel can drizzle over rolls. Serve warm. Skip the pecans, or vary the flavor with walnuts instead. Sticky buns are a staple at most bakeries these days. Though they seem similar to cinnamon rolls, there are a few key differences between the two pastries. Generally, sticky bun recipes, including this one, get their “stickiness” from ingredients like homemade caramel or honey, which is something you don’t often find in cinnamon rolls. 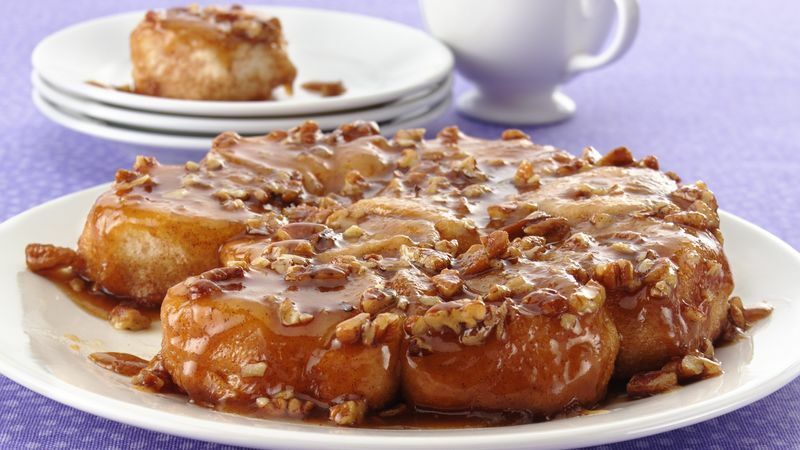 In addition, many sticky buns have a nut topping, which is achieved by layering nuts on the bottom of the pan and inverting after baking. If you don’t like nuts, however, you can take a note from the cinnamon roll book and add a vanilla or cream cheese glaze instead. One of the best things about this particular caramel sticky buns recipe is that it doesn’t require you to make the dough from scratch—no kneading or waiting for the dough to rise. In fact, this recipe is done from start to finish in 35 minutes! The secret is starting with our trusty Pillsbury biscuits. Not only can you start this recipe with a can of biscuits, but you can also jumpstart many sweet treats with biscuits like doughnuts, beignets and even classic monkey bread. Find all of these and more by browsing our all of our best sweet biscuit recipes.